These past few weeks have been an extremely busy whirlwind. We moved, just the two of us, in two days. By the way, I will never, ever do that again. Moving at with the amount of furniture and stuff we have is best left to professionals. We didn’t move far, we’re still in the same area, just now in a house with a backyard and pool to play in with my son and the dog. Our chocolate lab, Coco, has had a blast playing in the pool with us. The house we moved into had been vacant for some time, so the house needs a little attention. We’ve been super busy trying to catch up on all the maintenance, and spending lots of family time at Lowe’s picking up things for the house. Even though there are lots of little things to do, I wanted to start a project right off the bat in the new house that was ours. In our townhouse, we had replaced and done so much by ourselves. Tiling, wood floors, complete kitchen remodeling, bathroom remodeling, and lots of little stuff. So I wanted something in our new home that would make it feel more like our home and less like someone elses’. I wanted to start right away with the kitchen, but it’s just too much. It doesn’t need to be completely remodeled like our previous home’s kitchen, but it still needs quite a bit of work. So I decided to make my own little summer kitchen on the patio. In the back of the home under the patio is this area. There must have been a small summer kitchen there at one time. It opens up to a chimney space above. We have no idea what exactly was there before. The area is plumbed, so I knew this was the perfect spot to make my little outdoor kitchen. I toyed with lots of ideas for this space before settling on something. I decided to use a freestanding grill over a built-in, not only because of price, but also because I had read and heard such wonderful things about Weber grills. This Weber grill is a Lowe’s exclusive color. I love the traditional look to the color. 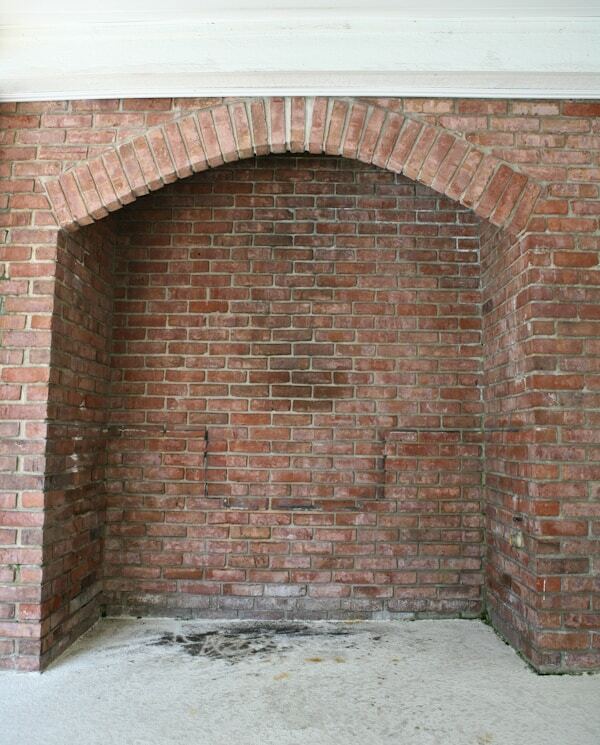 It goes with the brick great. It came with little stainless steel wings that we removed. What you see on either side of the grill are the frames of the counters. It’s just pressure treated 2 x 4’s put together with deck screws. On the right will be a small bar sink, and on the left will be a small counter space. The front of the cabinet and counters will be coming soon! Our next step is to cut plywood to make the bottom shelves of the cabinets and base for the countertops. We also have to level out the counters and attach them to the brick. I’ll be posting updates as this project moves along. I’ve been busy using this area, even though it’s not finished. That Weber gas grill is amazing! It’s the Genesis Espresso Porcelain Enamel 3-Burner Gas Grill model. It puts my old grill to shame. The grates of this grill are such a better quality than my old grill. . The grates easily get hot enough, and hold heat so your food gets perfect grill lines and it doesn’t stick. I do love the flavor of charcoal, but I don’t think I’ll ever go back, except for occasionally smoking meats. And did I mention how much easier this grill is to clean? I just use my grill brush and a wet rag on the warm grates. It’s too easy. Before I slammed my old grates on the concrete to free the burnt on food. 1. Choose the highest quality meat you can with a higher fat content, like 80/20. 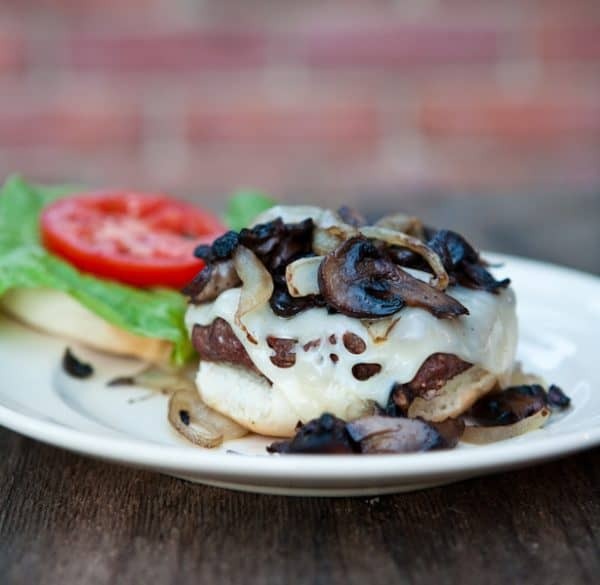 Better meat makes better burgers and the higher fat makes mush juicer burgers. 2. Keep the seasoning simple. Salt and pepper or a grill seasoning work great. A few dashed of Worcestershire, soy sauce or hot sauce in the ground meat also work well. More complicated recipes work better for lower fat burgers that need added flavor. 3. Start with 6 – 8 oz of meat. Turn the meat and gently form the patty in your hands, making the patty slightly larger than the bun. Try to avoid balling the meat in your hands and flattening it out on a plate. Overworking the meat causes tougher burgers. 4. Make a slight depression in the middle of the patty to avoid patties that are too fat in the middle after cooking. 5. Start with a very hot grill (or skillet) with clean grates. This will help prevent sticking. 6. Only flip the patties once, and never press a cooking patty. This makes all the juices run out. 7. After the patties have cooked, always let them rest like any other meat before serving. Do you have any more ideas for better burgers? I would love to hear them in the comments section! Gently form 1/2 lb burgers in hands. Season with salt and pepper or grill seasoning. Cook for 5 - 6 minutes per side, flipping only once, or until desired doneness. Saute mushrooms, onions and butter in oven safe skillet (I used a small cast iron skillet) on grill until tender. 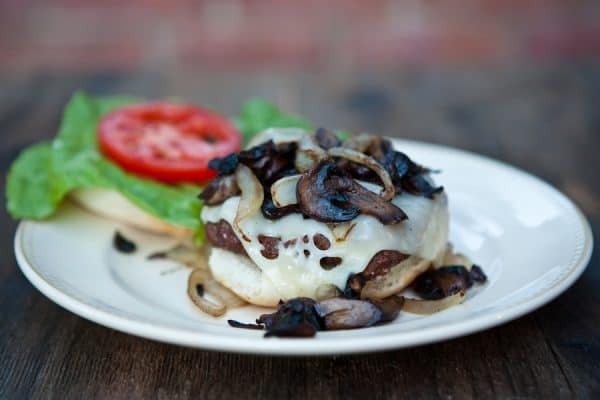 Top burgers with cheese and sauteed mushrooms and onions. Summer Kitchen Project Series sponsored by Lowe’s and Weber. All opinion’s 100% mine. Mushroom & swiss sounds so good right now. So jealous of your pool and I am in the market for a new grill. I will have to check that Weber out! Fun! I love that space. It looks like the perfect place to set up outdoors, and I can’t wait to see what you do to the kitchen inside, too! Congratulations on the house and on surviving the move! 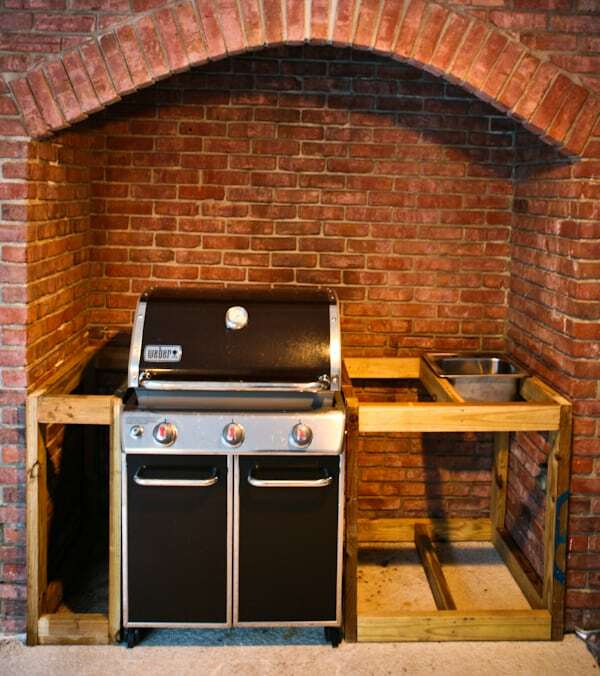 The burger looks amazing but your outdoor kitchen is beautiful. I hope you don’t mind but I shared your recipe on grubodex.com. 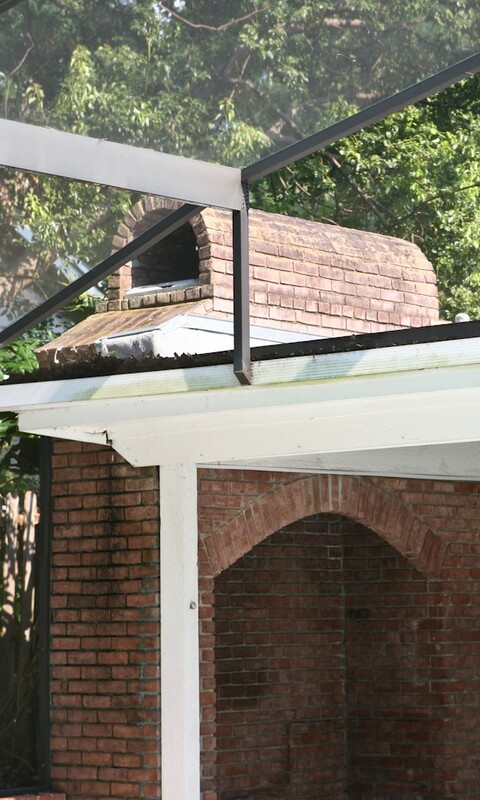 Congratulations – LOVE LOVE LOVE the outdoor kitchen! Have a feeling you’ll be spending plenty of time there! !